Competition won’t be the only thing heating up at the Tour Down Under and Australian Open, with soaring temperatures forecast for the week ahead. 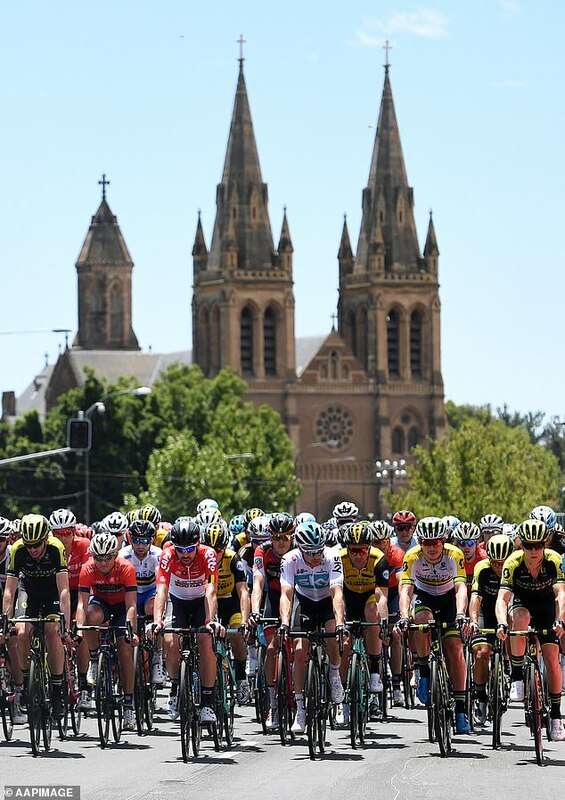 Tour Down Under officials will decide whether to shorten the first two stages of next week’s race in Adelaide, amid forecasts of temperatures exceeding 40C, Adelaide Now reported. The Bureau of Meteorology has forecast 41 degrees to hit the South Australian capital city on Tuesday. Stage One of the race falls on the same day – a 132/4km circuit from North Adelaide to Port Adelaide. When Stage Two of the race rolls in, temperatures are expected to hit 40C. Cyclists will have to endure the scorching heat to cycle 149km from Norwood to Angaston. While the officials will meet with a teams and riders representative on Saturday to discuss shortening the stages, a final decision will not be made until Monday. Australian WorldTour team Mitchelton-Scott director Matt White said Australia brought its own challenges compared to the European leg of the race. ‘The differences between racing in Australia and Europe are this is the first time people are exposed to it (heat) for the season which is a bit of a shock, and with the Australian sun the UV is double the strength here,’ Mr White said. He said he doubted any stages would be cancelled, despite the dire forecast. 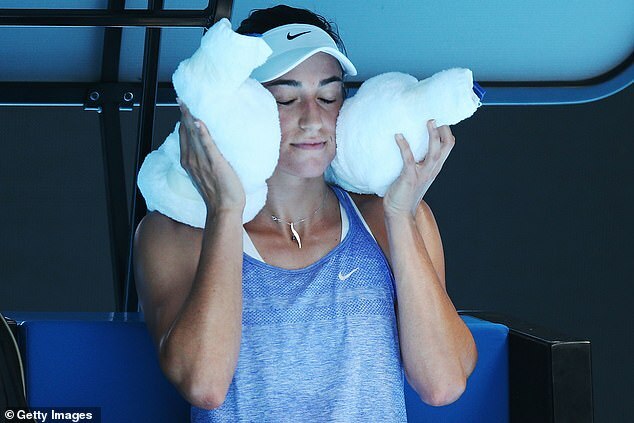 Cyclists will not be the only ones suffering through the intense heat, with tennis players set to swelter in the upcoming Australian Open. 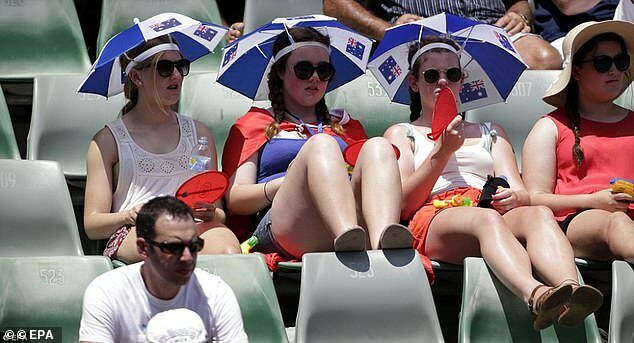 Spectators at Melbourne Park, the home of the Australian Open, will have to endure a blistering 37C on Monday as the world’s tennis stars take to the court. 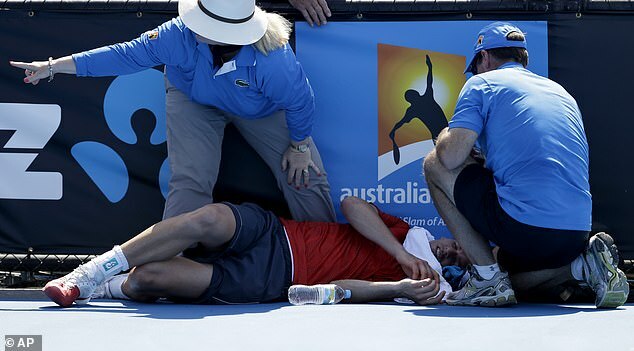 The Australian Open’s new extreme heat policy will be put to the test, as concerns for players’ and spectators’ health arise – reminiscent of the 2014 edition of the Grand Slam, which saw multiple stars withdraw from heat-related hallucinations. The new policy sees a mandatory 10-minute break put in place between the fourth and fifth set of a men’s match, as well as a new ‘heat stress scale’ taking into account players’ feedback. Play will be suspended on outdoor courts and the roof closed on marquee courts when the heat scale reading is 5.0 or above. The new scale takes into account air temperature, radiant heat, humidity and wind speed, with the sea breezes forecast perhaps skewing the results. 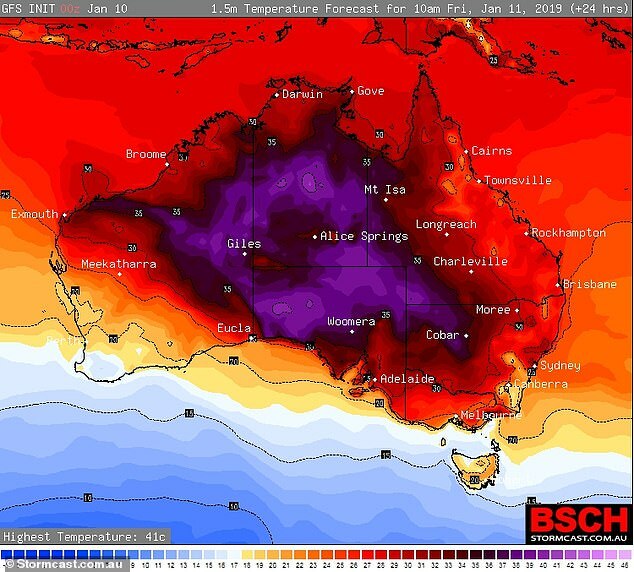 Bureau of Meteorology senior forecaster Rod Dickson said there was a ‘little bit of uncertainty’ in just how severe the heatwave will be. ‘We’re forecasting 37C and pretty sunny,’ he told Daily Mail Australia. There’s little respite from the heat forecast for the rest of the week, with an early forecast of 32C on Tuesday expected to rise to 35C, he says. The rest of the week will teeter around 30C, expected to sink back into the high-20s by the end of the week. For tennis fans, he says the best advice he can offer is to follow the ‘slip, slop, slap’ mentality. Weatherzone meteorologist Tom Hough told Daily Mail Australia temperatures are climbing around the entire country. ‘In terms of what’s classified as a heatwave, it differs depending on where you are,’ Mr Hough said. 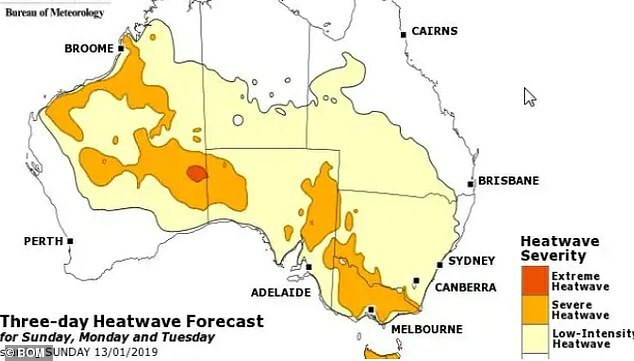 Low intensity heatwave conditions are forecast from Friday right through until Monday for most of the Northern Territory, western and southern Queensland, most of New South Wales, Victoria’s far north, most of South Australia and the north eastern half of Western Australia. 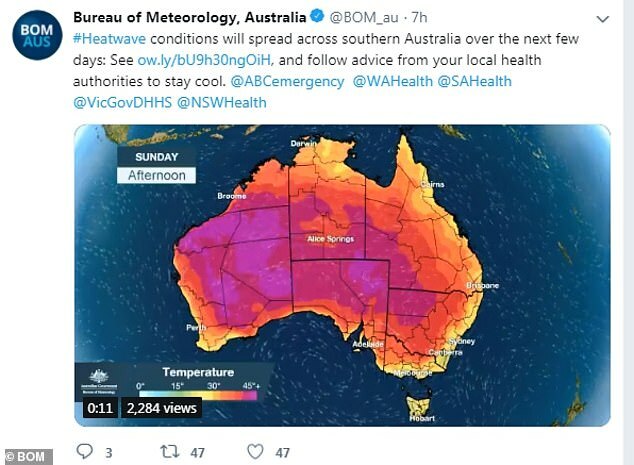 Parts of Western Australia are also looking at severe heatwave conditions. ‘Saturday to Tuesday looks like the hottest period throughout the next week as the severe heatwave conditions spread,’ Mr Hough said. Canberra will be 35C on Saturday with the temperatures hovering around the mid-to-high 30s for the early stages of next week. Sydney is forecasting great beach weather, with high-20s and low-30s forecast through to Tuesday. Perth will gradually get warmer – 28C on Friday, 32C on Saturday and 34C by Wednesday. Brisbane will see sunny conditions and 31C for the weekend and into next week. Meanwhile, Darwin will be 34C and sunny until at least Saturday. But heavy downpours – as much as 35mm of rain – are on their way from Sunday onwards. SUNDAY: Min 26, Max 30, Storms. MONDAY: Min 25, Max 30, Storms.